Yesterday we made Pink Hot Chocolate as part of our Valentine countdown. It’s SO yummy, and my kids were pretty thrilled by the fact that it was pink. Even the boys! It’s a fun way to get warm and celebrate the holiday! My kids think I’m magic. :) They have no idea how the hot chocolate gets pink, and I’ve told them it’s a very special mom secret (passed down to me by my mom), and that I’ll tell them all about it when they grow up. They like to watch whenever I’m working the kitchen, but I made them leave when it was time for the “pink” part. I LOVE it. I make it a couple of times every year during the Valentine’s Day season, and it’s always a hit. I love to serve it as part of our Valentine’s Day breakfast, and it’s fun and festive for any kind of Valentine party or gathering. It’s extra cold in lots of places this winter, so pink hot chocolate might be the perfect thing to warm up! It’s a simple recipe, and can be made in less than 10 minutes. I give my kids the choice of whipped cream or marshmallows, and then a few sprinkles for the top. They love creating their own special drink, and it makes it even more fun! In a saucepan over low heat, melt the white chocolate chips with the evaporated milk. Once melted, add the whole milk and heat through. Start with 3 cups, and add more to taste. Remove from heat, and add drops of red food coloring until you get it to the color you like! Serve with whipped cream or marshmallows, plus a few fun sprinkles for the top! Yay!! 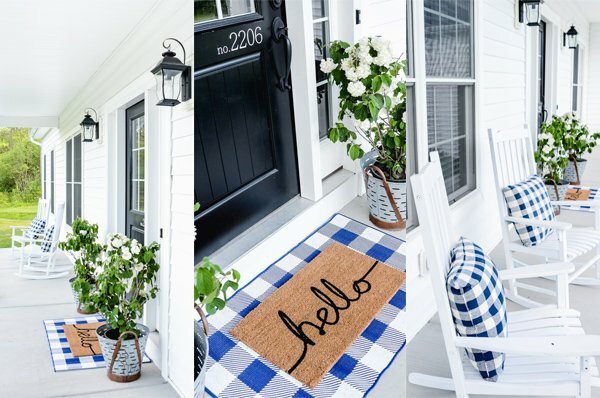 been waiting for this post :) Can’t wait to make it! excellent. cant wait for the pink hot chocolate day on our countdown! 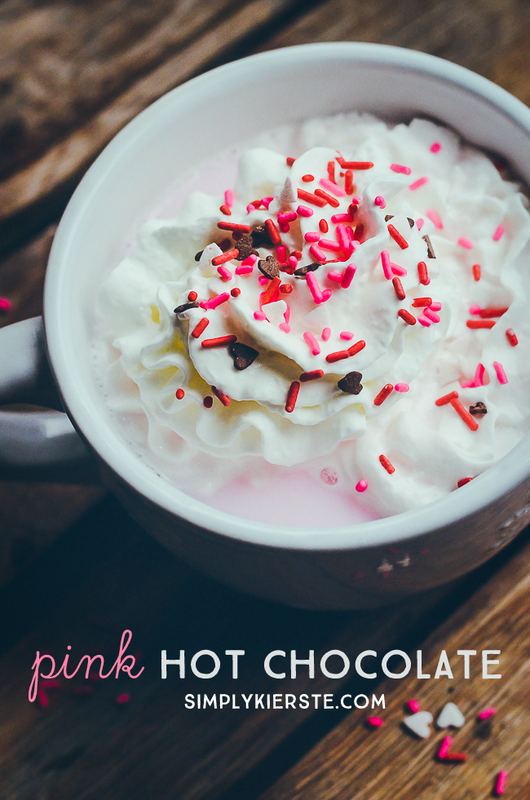 Love the pink hot chocolate and love the idea of a countdown to V-day. BTW, I was wondering if you were ever able to find out the paint color on your walls. Thank you so much for this recipe and sharing the special way you present it to your children. I’m going to do this for my grandchildren this year. I’ve been unsuccessfully searching for this “special touch”. My kids are going to love this!! Thank you. I was wondering what size can of evaporated milk is used. Why the whole milk? Does 2% not work correctly with this recipe? Thanks! It sounds yummy! I am going to credit you for the image and add it to my blogger and pin it as well. I have a couple twists for it as well for other holidays as well. Thank you for this idea. I like it. I think it could be done with white chocolate as well. Oh yes–it’s definitely not just for Valentine’s Day! We love changing it up, and it’s a basic recipe that you can do pretty much anything with!! Thanks so much for dropping by!!! This is so cute!! I will definitely be making this drink during the Valentine’s Day season!! Thanks for sharing! Thank you! It’s SO fun–perfect for Valentine’s Day! I have a group of about 20 that i would love to make this for, should i just double the recipe? Any suggestions? Thanks! For that many, you may want to triple it. We have a family of 8, and one batch is just enough for us! Lol. I’m honestly not sure, Amber, I’m sorry! I personally would be okay keeping it warm for my kids, but you may want to do a little searching online to see if you can find out anything before you decide. And if do, please let me know! !